Lavender has been used for centuries for its calming properties but it can also help relieve pain, soothe the skin, and take the edge off of depression and anxiety. With all of its potential uses, it definitely deserves a place in your home remedy tool kit. As you use lavender, keep in mind that a small portion of the population is allergic to it, particularly when it is applied to the skin. If you notice skin reactions to this plant or oil, you obviously should stop using it, but also investigate your home to make sure you have none tucked in your pillow or perfuming your sock drawer. In a 1991 study, researchers caffeinated mice, get them especially jittery, and then exposed them to different treatments to test whether lavender would have a calming effect. Indeed it did. Apparently, Starbucks should have special aroma therapy services. Use a nebulizer in your bedroom through the night to help you relax as you sleep. Make the lavender spray described below and spray your bed sheets before turning in. Rub lavender body oil into your chest in the evening before you go to bed. Drink a cup of lavender tea before bed — simply add lavender blossoms to hot water or to a relaxing tea like chamomile. Use lavender in bath water for pain control. A 1994 study examined the effect of lavender oil baths on the control of pain from normal childbirth. It did not find a large effect but noticed in days 3-5 after birth (when the new mom often just arrived home and pain tends to be highest) that the moms taking lavender baths had a reduction in pain. 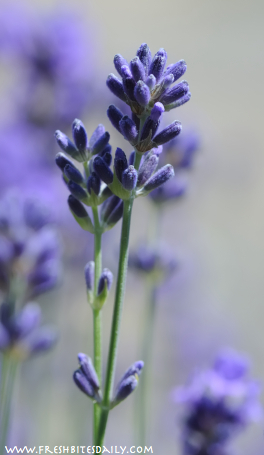 A 2006 study found lavender oil to be effective in reducing neck pain. Rub your lavender body oil gently into a minor burn or scrape. Treat an insect bite or sting gently by rubbing in your lavender body oil. Rub into areas affected by dermatitis or specific skin irritations such as eczema. Soak your sore feet in a warm foot bath with a few drops of lavender oil. Take a lavender bath by adding a few drops of lavender oil to your bath water. You can add blossoms to it as an alternative but I can tell you that your bath will be a bit messy to clean out and may stress your plumbing…. Use lavender in bath water for pain control. A 1994 study examined the effect of lavender oil baths on the control of pain from normal childbirth. It did not find a large effect but noticed in days 3-5 after birth (when the new mom often just arrived home and pain tends to be highest) that the moms taking lavender baths had a reduction in pain. A 2011 study examined the effect of lavender on wounds studying a group of postpartum women with episiotomies. It found that lavender treatment helped reduce redness of the effected area and tended to be associated with more pain relief. To aid in healing of wounds, apply a drop of lavender oil to the effected area. Mixing lavender oil with a small amount of carrier oil may make it easier to apply and may help the lavender oil elements sink in more quickly and thoroughly. A 2005 study found that lavender essential oil kills cells of Candida albicans and may more generally prevent the spread of fungal infections. To get fungal infections under control, make your custom lavender body oil as described above and massage the mixture into an affected area. As I mentioned above, some people are allergic to lavender oil and others may be allergic to other ingredients of these recipes. Watch your reactions and discontinue use if you notice any negative side effects. Think of lavender as you do any other spice. Fine chop the blossoms (the food processor works wonders) and add them to the fat in your recipe. Be it butter, coconut oil, or whatever it is that you use, add the minced blossoms to your fat, preferably when the fat is warm, and you will infuse your recipe with lavender. 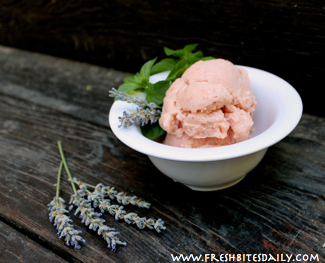 We have enjoyed lavender plum ice cream, lavender peach ice cream, and lavender plum jam. It complements many of the summertime fruits, the season when lavender tends to bloom in the United States. 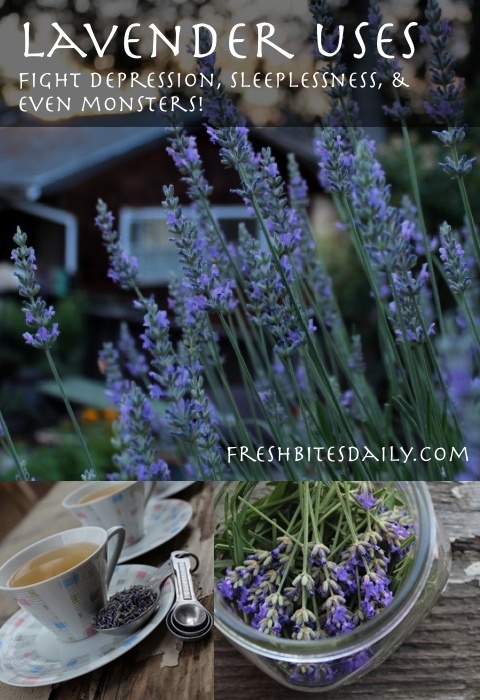 Lavender tea, of course, is simple to make and an effective drink to promote relaxation. 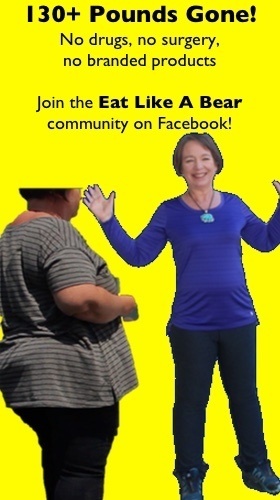 (Learn the simple process from us here or check out a recipe from Divine Health From The Inside Out here.) One way to make a quick tea is to keep a lavender syrup around. Krissa at More Than Mundane provides a recipe for a lavender honey syrup (here). The flavor of lavender sings against lemon, making lavender lemonade a popular summertime beverage. Here is a lavender lemonade recipe using dried lavender flowers (here) from Home Grown and Healthy. Find another interesting beverage idea by Melanie at Pickle Me Too, a lavender honey milk kefir (here). Particularly to use lavender oil for relaxation, you will want to purchase a nebulizer. This requires a bit of start-up cash but your results will be better. The oil will last longer and will be more effective. We recommend this nebulizer along with a quality lavender. Follow the instructions on the nebulizer for use. See below for the best deals on lavender oil and for a good nebulizer. By far your best bet for a lavender spray is to buy a new spray bottle, fill it with water, and add five drops of lavender essential oil to every 1/2 gallon of water. I love this use of lavender spray at Red and Honey (here). Did you know that lavender will keep monsters away? It’s true. Your child can keep it at his or her bedside and spray away when that little nighttime fear crops up. The fact that lavender soothes as well has made this strategy a complete success. No monsters have actually appeared in the Red and Honey home. Kate at Real Food RN will hook you up (here) with a specific discussion of lavender spray for bed linens. You can buy lavender oils made for you but it is so simple to make it yourself that you might as well save on the cost. Buy a carrier oil as a base and add lavender oil to it. To get the most out of your lavender, we recommend jojoba oil as a carrier because it helps the lavender penetrate more deeply (5 drops lavender in one ounce of jojoba). See below for lavender and jojoba oil sources. Use lavender oil to rub into skin to improve skin irritation and reduce muscle and joint soreness. For recipe ideas, visit Real Food RN (here) who makes a lavender and eucalyptus salve which would be great to clear chest congestion. Find a lavender salve/body lotion at Primally Inspired (here). You may also check out this nice lavender lotion bar recipe at Gourmande in the Kitchen (here). Meagan at Growing Up Herbal uses lavender in a salve to treat minor burns (here). Simply add a few drops of lavender essential oil to your warm bath water to relieve pain, relax, and improve your mood. Amy at Real Food, Whole Health provides a general recipe for bath salts (here). Insert lavender essential oil and you’re good to go. For more specific applications, check out this food rub at jarOhoney (here). If you are into natural cleaning products, you have probably cleaned with a basic, inexpensive white vinegar. 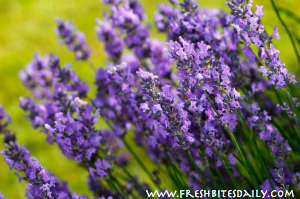 Leona at My Healthy Green Family recommends we infuse it with lavender (here). Great idea! (As I run to the pantry…). Becky at Rooted Blessings uses lavender as a mold and mildew fighter in combination with tea tree oil and eucalyptus oil here and a bacteria-fighting “potty training spray” (here) that will have far more uses than little potties. You can also making a scouring powder with a lavender scent. Find such a recipe in The Nerdy Farm Wife’s Lavender E-book which you can find for free here (you will find other lavender use ideas there as well). When purchasing any essential oil, quality does matter and it is important to buy from a vendor that is reputable. If you have never used lavender oil before, you might also want to start by buying an ounce or two. If it works for you, buy a larger four or eight ounce bottle (or even larger). To buy in bulk for the best saving, we recommend this vendor. You can also find a collection of herbs, jojoba oil, coconut oil, and other carrier oils making this a one-stop shop for your lavender concoctions. The prices and quality are excellent. They carry an excellent nebulizer as well (see here). As an alternative, if you are just looking for lavender and jojoba oil (and even a nebulizer), our Amazon partner is a good option.